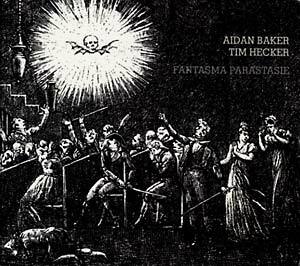 "Fantasma Parastasie sees the pairing of Aidan Baker, of the ambient doom band Nadja, and Tim Hecker, two of Canada's brightest musicians in the world of abstract electronic music. Tim Hecker has been enjoying the rewards of a stellar career and discography, devoid of filler, due to his incredibly high quality control. His full-length Harmony In Ultra Violet was viewed as a major release in the genre of experimental electronic music. Aidan Baker, on the other hand, works under very different circumstances, releasing material both as a solo artist and as a member of the duo Nadja. His prolificacy is on par with that of Merzbow and the late Muslimgauze. Thankfully, Aidan Baker is one of those musicians with the ability to record and write new music quickly and without sacrificing the quality of his art. Anyone familiar with both Aidan Baker and Tim Hecker is more than likely familiar with Alien8 Recordings as the two musicians have collectively released seven records for our label thus far. While Baker has collaborated with the likes of John Duncan, Black Boned Angel and Fear Falls Burning, among others, this marks the first collaboration to be released by Hecker. This release, divided in eight movements, blends together to form a fluid example of a collaboration that works. Unlike one of those collaborations where artists throw some sound files back and forth via the internet, this release is the fruit of various real-time recording and mixing sessions the two artists worked on in Tim Hecker's Montreal studio. The pieces on the record blend seamlessly into one another, creating a deeper listening experience, as is the case on a number of Tim Hecker's solo outings. While Baker and Hecker share a penchant for creating a powerful blend of ambient noise, Fantasma Parastasie finds the more dissonant elements tempered by an emphasis on ambience and even occasional melody. This release is available on CD in a digipak packaging."